Floreat has a strong management team including a former adviser in the Cabinet Office, a local authority schools inspector, the executive head of a successful academy trust and staff who have worked in communications, finance and with the Education Funding Agency. The choice of provider must now be endorsed by the Secretary of State who will make the final decision. The aim is to open the new school in September 2015 and for it to admit 60 children a year, eventually providing places for up to 420 pupils, alongside a nursery with space for 50 toddlers. The council has identified that new school places are needed across Wandsworth to cope with the growing demand from parents. Between 2002 and 2011 the borough’s birth rate rose from 4,080 per annum to 5,477. 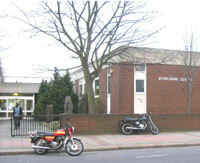 In Earlsfield ward the number of babies born each year has grown from 225 in 2003 to 354 in 2011 – a 57 per cent increase. As well as backing a new school on the Atheldene site, the council is also looking into the possibility of a wider regeneration scheme in the Earlsfield area. This could include a new state-of-the-art community health centre to replace the Brocklebank health centre, while a number of nearby council-owned buildings that are empty and surplus to current needs could also be included in a regeneration scheme, bringing new homes, shops and jobs to the area. The council’s education spokesman Cllr Kathy Tracey said: “We believe this site is ideally placed to provide an excellent primary school and nursery for children in the area. It has very good transport links and is in a part of the borough that needs additional reception places if we are to keep pace with the growing demand from parents. “We have now looked very carefully at a wide range of possible academy providers and are delighted to have selected Floreat as our preferred choice to run the new school. We strongly believe they will bring a great deal of expertise, knowledge and leadership to the school. We think they could offer local parents a great new choice of school with a strong ethos on learning and achievement. Over the past three years the council has added 25 extra reception classes in schools across the borough to meet the growing demand from local parents. Three of these classes are in Earlsfield ward, with 90 extra places provided at Beatrix Potter, Swaffield and Earlsfield primary schools. However even with these school expansions, the latest projections show that further places will soon be needed. As well as changes in the birthrate, pressure on places is building because of the growing reputation of Wandsworth schools for academic excellence. Education standards watchdog Ofsted currently rates 92 per cent of Wandsworth schools as good or outstanding. In comparison only an average of 74 per cent of schools in other parts of the country, and 80 per cent in London, have been given the same quality rating by Ofsted inspectors. In 2012 Wandsworth’s primary schools achieved the fourth best combined Key Stage 2 English and mathematics results across England and Wales. On average, more than ninety per cent of children progress by at least two levels in English between Key Stages 1 and 2. Wandsworth is now ranked second in the country, behind only the City of London, for pupils’ progress in this vital subject. As well as expanding existing schools in the borough, the council has also been fully supportive of new free schools opening in Wandsworth. Three of these opened at the start of the current autumn term and are proving hugely popular with parents. They are the new Tooting primary school in Franciscan Road, sponsored by Graveney School, Rutherford House primary school in Balham High Road, and the Mosaic Jewish primary school, which has opened in Roehampton and admits half of its pupils on non-religious grounds.